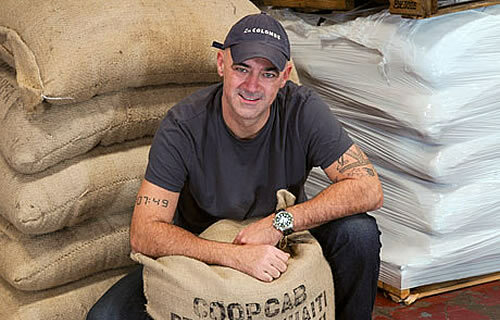 Todd Carmichael, the founder of La Colombe Torrefaction, is known around town for being the local coffee innovator and a philanthropist of the highest order. But, his most interesting life pursuit is that of the insatiable explorer, the guy who crossed Antarctica by himself, setting a Guinness World Record in the process. Eater Philly chatted up Carmichael about his latest adventure, a new reality show debuting on The Travel Channel later this year. What’s the name of the new show? Well, there’s no set name, but the working title is “Coffee Hunter.” It’s about me searching out the best beans in re-emerging countries, and establishing relationships with these bean growers in fair trade. Is the show a serial show or a special? We shot the first few episodes, but the deal is for 8. So, it’s going to be at least 8 episodes long. The first show is pretty much done and in the can. It’s a trip to Haiti, and it gets pretty crazy. We’re going to places with no tarmacs, no roads, and no police in some cases. We’re not going to Napa Valley to find grapes. Coffee is grown by the poor, in the poorest places in the world, so re-opening these trade lines is always an adventure. Where are some of the other places you’re shooting episodes for Coffee Hunter? Angola, Myanmar, Cambodia, and Madagascar. We’re headed to re-emerging places that in a lot of cases the world forgot about. It’s funny, people are always on the hunt for buried treasure, and in my opinion when you’re looking for that, you need to go where no one else is looking. We’re working on Cuba, too, which is my real goal. We have to figure out a way to get there and establish trade without getting arrested (laughs). But, really, Cuba is a goal for us in terms of coffee at La Colombe and for the show. Have you hit snags along the road since so many places are very under-developed? Yeah, I can tell you the key to success on a show like this is having a ballsy cameraman, and mine is the best. Nothing rattles him. He used to be on that crabbing show on Discovery (The Deadliest Catch), so he knows how to handle himself. Most of these countries are places were people still feel comfortable shooting at each other without a thought, so we’re always a little on edge. We have run-ins with coyotes and wildlife, too. It got a little hairy. There’s a lot of people and animals that did not want me to be where I was, that’s all I can say. Do you get into aspects of local culture or is it strictly a bean treasure hunt? Well, it is Travel Channel, and you know about my background, so it’s a good split of interacting with local culture and a search for these beans. There’s that whole aspect of “are there any beans to find here, or have they been long gone?” drama of course. We hike to the highest point of the area, and see what they have, see if there are beans growing. We’re not always successful. What do you think will be the most surprising aspect of the show for viewers? Beans aren’t grown at chateaus in wealthy areas. There aren’t these beautiful vineyards full of beans growing all over, usually they’re grown by farmers who also have yams, potatoes, and peas in the same rows of soil. Sure, you can go to developed areas like Costa Rica and see it in a different light, but in reality, most of our beanage comes from places like Haiti. It’s going to surprise people to see that, I think. People group wine and coffee together in terms of enthusiasm and those who are passionate about it, as well as knowing good quality product. But, we save the meat of a grape to make wine, and we save the seed of the coffee plant to make coffee. It’s a different beast. And that’s almost a metaphor for the different cultures surrounding wine and coffee production. When will the show air? Well it’s all about what the Travel Channel wants to do, and they’re very excited about it. I’ll throw out a guess and it’ll be wrong. But, my guess is May-ish. Before the end of the summer, I believe.